3 x 4 inch Wild Print Organza Bags. 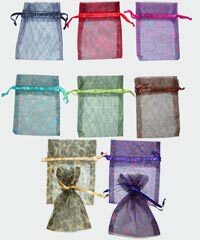 These drawsting organza bags are great to give small gifts to others. Use them for hostess gifts, wedding and shower favors or just use them to dress up your favorite gift. Looks beautiful in a gift basket ! 6 bags per pkg of one color. Pouch area dimensions are approx: 2.5 x 3 inches.